Published on February 8, 2012 by cara.b.b. i found this recipe for three ingredient chicken (including the chicken! ), and it was too darn easy not to give it a try. the prep time is minimal, and the cooking time isn’t bad either. put the chicken in a 9×13 pan. 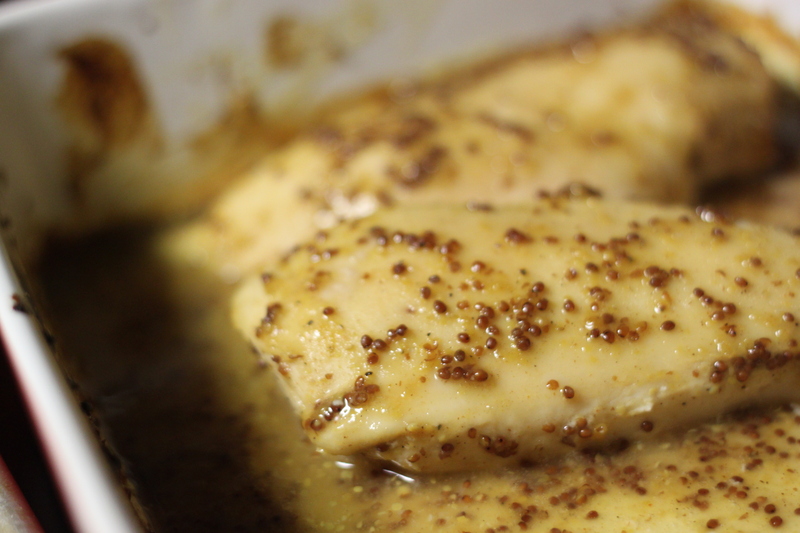 mix together the mustard and honey, and pour it over the chicken. there will be enough that it makes a little pool in the bottom of the pan. bake at 400 for 25 -30 minutes, basting the chicken once halfway through. now for the sweet potatoes. you’ll actually want to get these ready first since they take longer in the oven. peel your sweet potatoes and cube them. try to make them similar sized, so they’ll cook at the same rate. 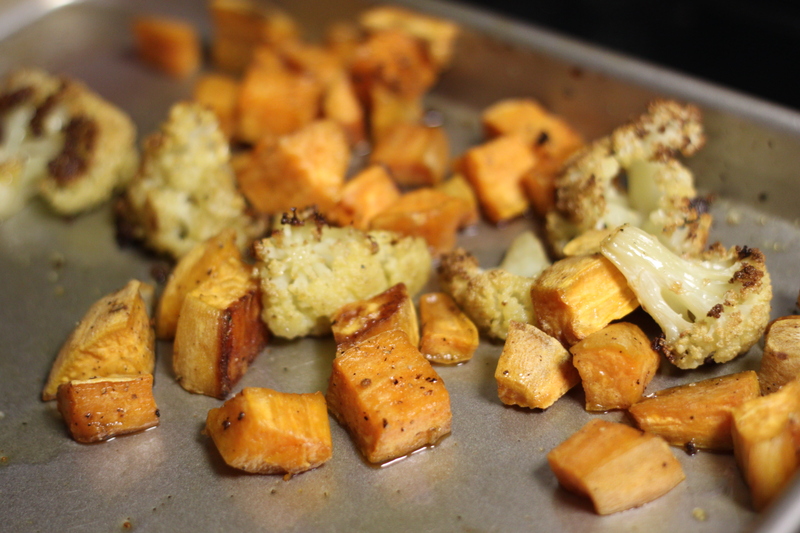 throw them on a pan, drizzle with olive oil, salt, and pepper, toss them with your hands, and into the oven they go. bake for about 40 minutes at 400 (or 425 if you don’t have the chicken in the oven also). you’ll want to toss them around about halfway through so you get more of the crispy sides – the best part! 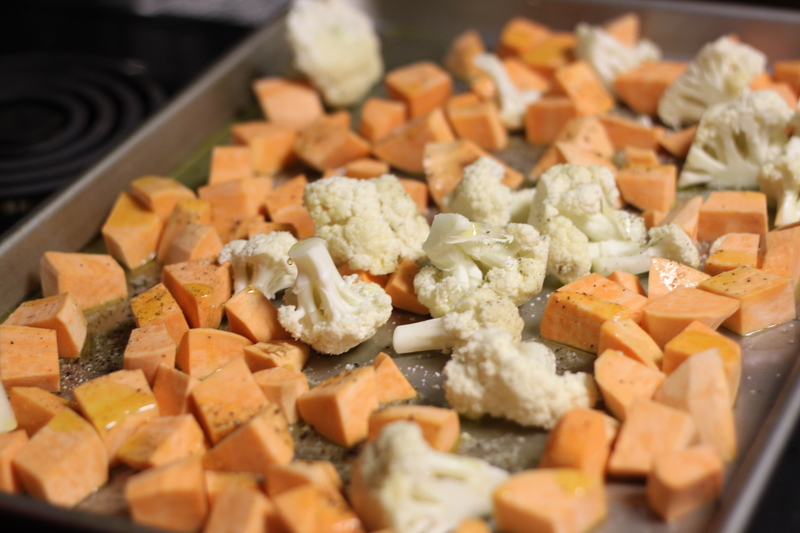 this time, i threw some cauliflower on the pan too, and it turned out great. i think we can call all of this a 40 minute meal. add a salad and it’s super healthy too! Looks yummy! And I love only 3 ingredients for a main dish. Nice variation for the sweet potato. Can’t wait to give it all a try!